Friends already using Shareagift for Christmas! I know, I know, it’s not even Halloween yet, but we’re already excited as we’re just starting to see the first few Shareagift Pages created by some of you super-organised peeps planning ahead for Christmas! The Actors Touring Company have already started a Shareagift Page for their company Christmas Stocking! They need to buy an expensive piece of filming equipment so they can filem their tours in 2013 and decided Shareagift would be the perfect way to do it. Good luck guys, we hope you get all the funds you need :). 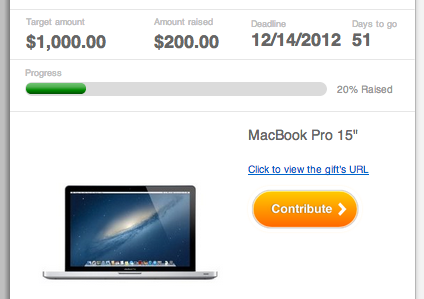 The lovely Tara, just created her Shareagift Page for a brand new Macbook Pro laptop computer from her family as a way for her family and friends to afford the gift she really wants – and she’s already collected $200 towards it! The beauty about Shareagift is that you can use it collect money for absolutely anything – from that perfect gift, to charity fundraising, to sharing the cost of a group trip – so what are we waiting for – Christmas is only 61 days away!